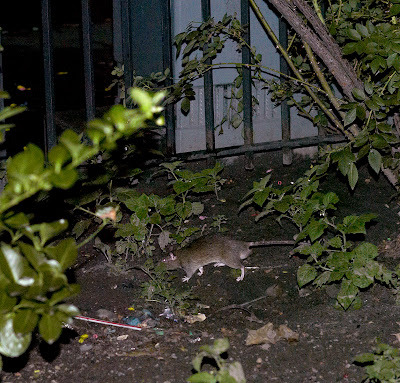 On 12 July , 2007 from 11:12 PM to 11:36 PM we photographed these rats at the complex of rat-holes near the St. Marks Place and avenue A entrance . 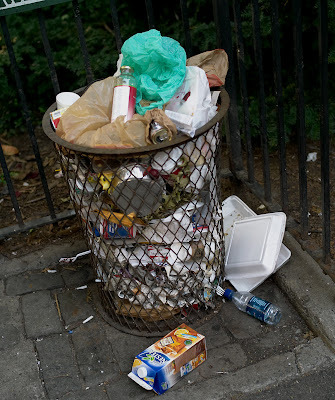 This complex of rat-holes has been in use for many months , likely for more than a year . 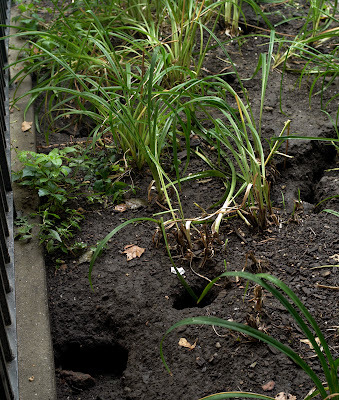 If anyone had made any effort at all to find rats in Tompkins Square Park they certainly would have found these holes with the rats that use them a long time ago . 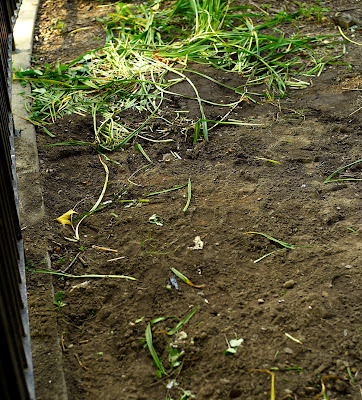 This complex was filled-in with dry earth on 21 July , 2007 with the rats re-opening one rat-hole at this location by the next afternoon . 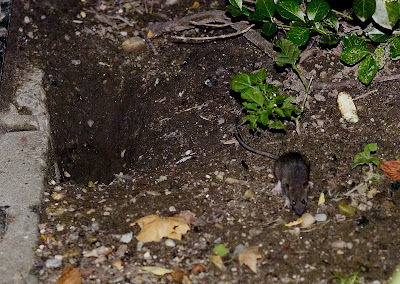 We were not able to successfully photograph most of the rats at this location on this evening simply because it is very difficult to focus and follow a fast moving rat in near darkness . The pictured brightness of the above scenes is misleading and is an artifact of the digital photgraphic process . 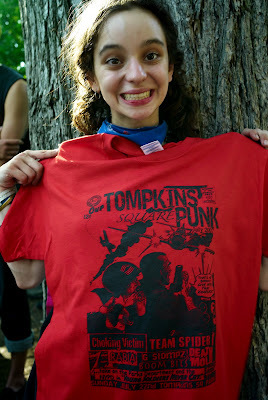 In reality the rats were barely visible . In this 24 minute period we took 54 pictures of rats . There were many more rats seen than photographed . 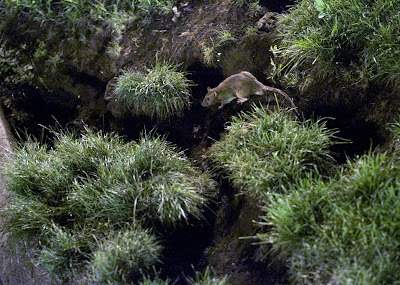 At times rats were seen side-by-side at a particular rat-hole with one rat entering the hole while the other rat was exiting the same hole . 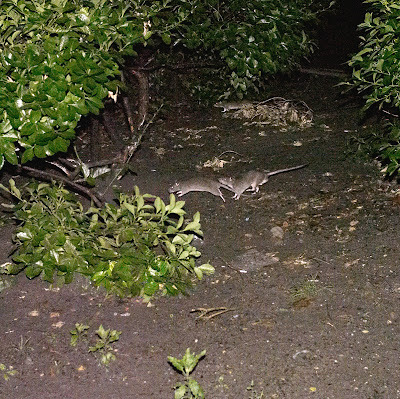 Often during this 24 minute period one could see as many as 3 or 4 very energetic rats running in different directions . 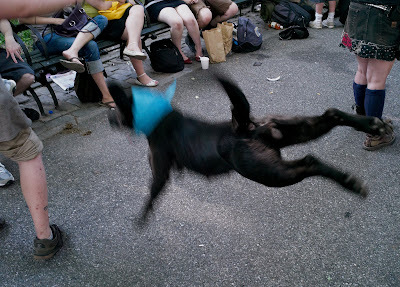 There was no electronic flash used to make these photographs : they are all by available light using a very fast 50 mm Noctilux lens with the aperature wide-open at f 1 and exposure times of .25 to .3 second , with the camera , a Leica M8 , being hand-held while shooting . 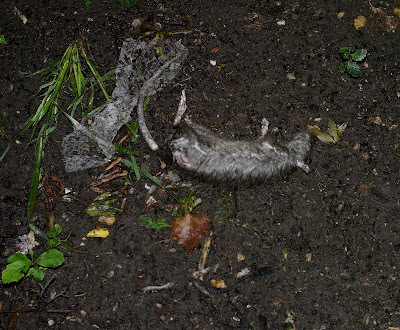 This large rat photographed on Monday night died here near the entrance of the playground sometime in the 24 hours between Sunday evening and Monday evening . 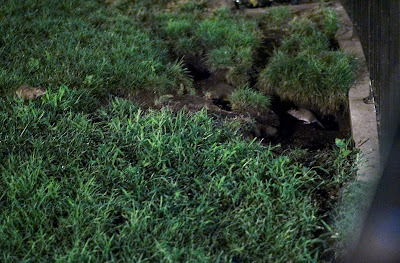 Sunday night a few rats were seen behaving eratically , walking about much too slowly and turning in circles . 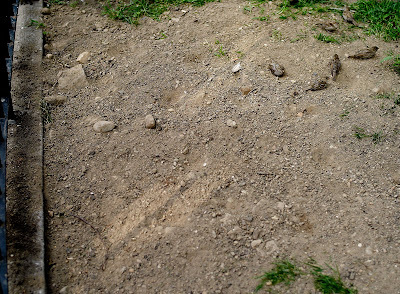 These rats probably had been poisoned with baits placed in their holes before the holes were filled-in with earth . 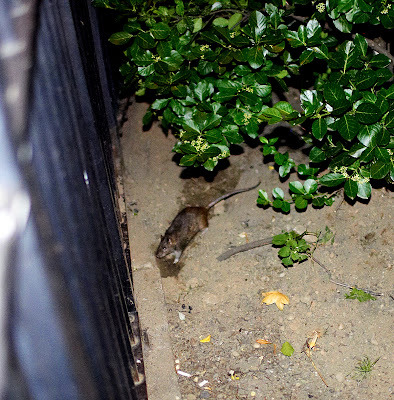 This one death of course did not deter the 4 rats above from endlessly running about playing in the shrubbery that is also frequently used as a latrine by park regulars when the parks public restrooms are closed . 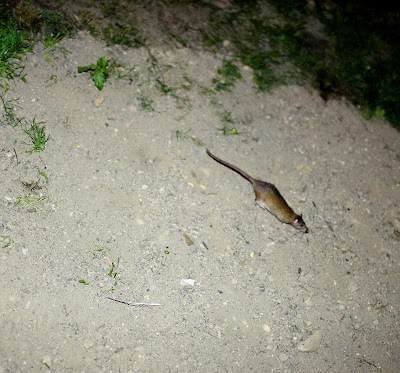 Nor did it did discourage the amorous pair below cavorting about ; a male rat chasing a female rat ever so delicately . 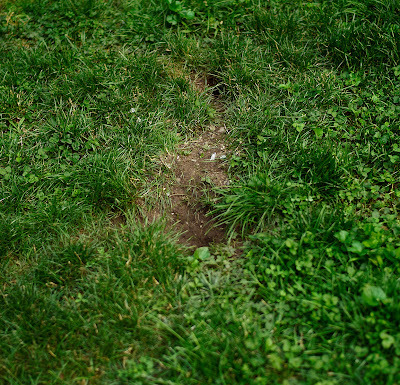 On the lawn across the walk from the playground a new rat-hole is being excavated successfuly by some unseen industrious hardworking rats . This hole likely helps to make-up for the loss of some filled-in holes not too far away . Tuesday afternoon 2 previously filled-in rat-holes near the playground drinking fountain can be seen to be open and functional . Later on Tuesday a rat can be seen below ready to enter the one of the 2 holes nearest the drinking fountain . 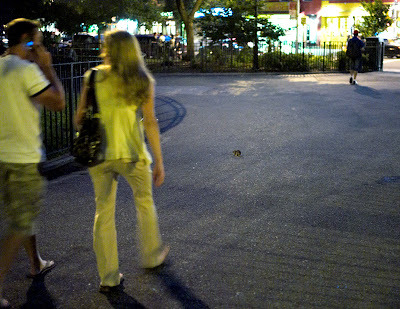 Tuesday evening a rat scurries ahead of a cell-phone wielding couple stolling in TSP . 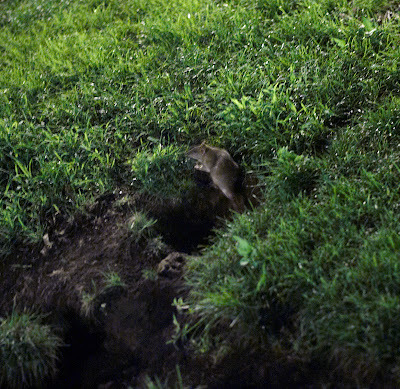 The rats are not at all inhibited in their use of the park walkways when traveling from a food source to a rat-hole . 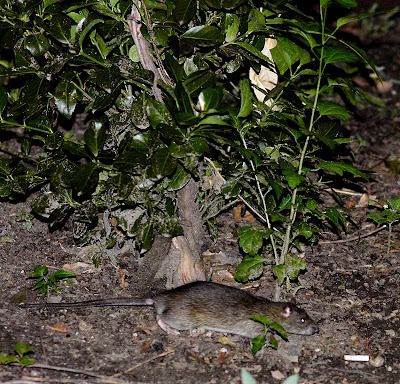 Though rats are wary of humans they travel freely in their presence , especially after sundown . 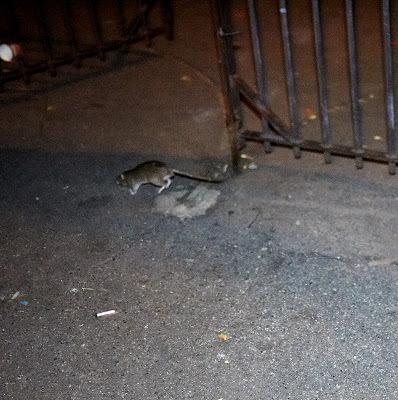 Indeed rats can even be seen routinely in the playground during the later part of the day as children play . This is especially true near the shrubbery at the edges and near the drinking fountain . During the afternoons this last winter the number of rats was considerable enough at the edge of the playground that the Red Tailed hawks would commonly sit in the trees at the edge of the playground waiting to descend on some tastey incautious individual rat .Such predator-prey encounters made afternoons at the playground frequently entertaining . 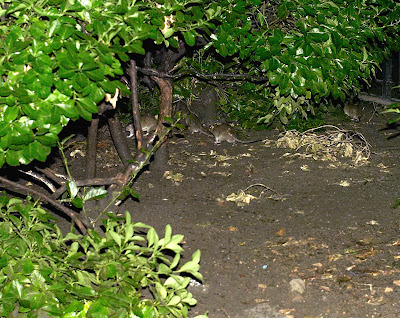 Tuesday evening both adult and young rats could still be seen in large numbers in the shrubbery near the playground seemingly unaffected by any recent efforts to reduce their number .The large well-fed sleek mature rat below attests to the fact that the rats of Tompkins Square Park are well fed successful mammals . 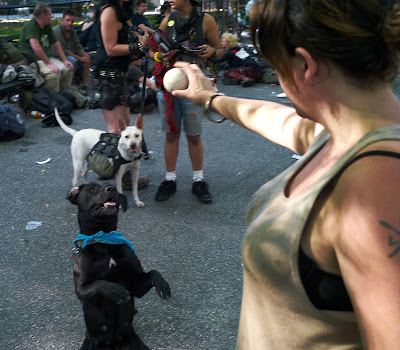 Bands , beer , dogs , 1 domestic rat , between 300 and 400 humans and one good fight with 2 to jail and 1 to the hospital . 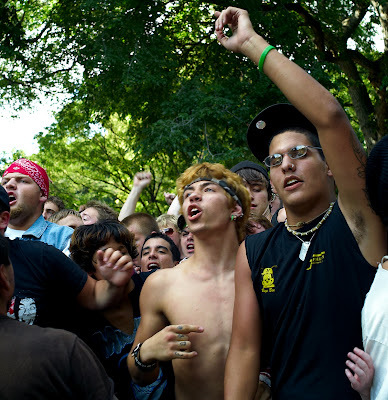 There was a concert in Tompkins Square Park this last Sunday . This concert was just one of an end of July music double-header ; another concert will happen this next Sunday 29 July , 2007 . 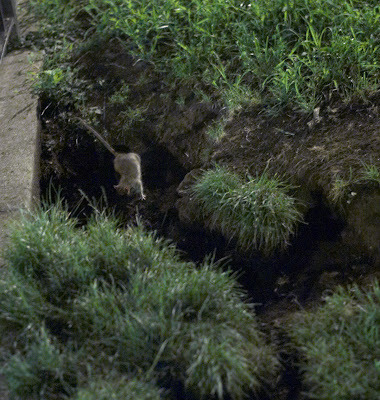 ABOVE : Male rats in and near the re-opened rat-hole under the shrub near the playground water fountain on Sunday night . 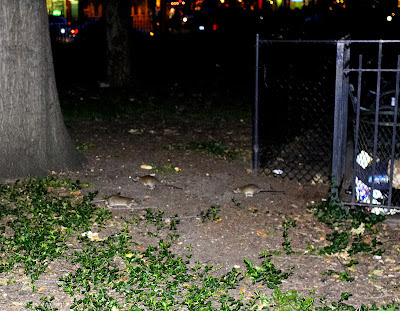 For a few weeks we here at NMNL have been working on a sort of natural history of the rats of Tompkins Square Park .The rats are a big part of TSP and at night they do most certainly Rule .They have earned their condign attention in the form of their own natural history. We were taking our time doing the observation , picture-taking and research . 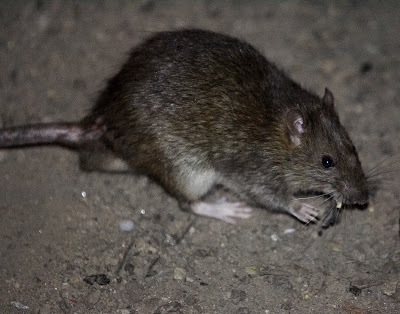 The natural history was to be presented over several posts with entertaining anecdotal material as well as detailed observations of rats ,their ways and their homes in TSP. 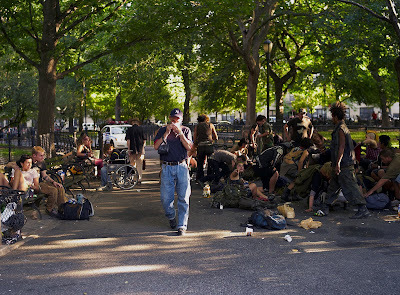 A few days ago we were apprised of rumors that one or more local newspapers had decided to possibly do stories on just exactly our subject ,the rats of Tompkins Square Park . 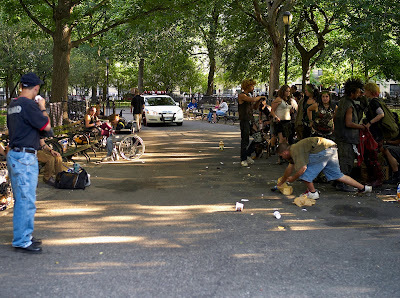 Indeed we even heard rumors that some one in the news bussiness had asked some in authority in 3 different local or city-wide government agencies if there were a rat problem in Tompkins Square Park with a rumored resounding and certain no as the answer from these government officials. 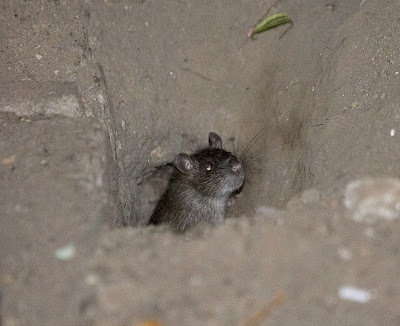 Surprisingly on Saturday , though a rat problem was rumored to have been reported to not exist in TSP , quantities of dry earth were used to fill-in several rat-holes in at least 3 different locations near the playground near the park entrance at St Marks Place and avenue A . 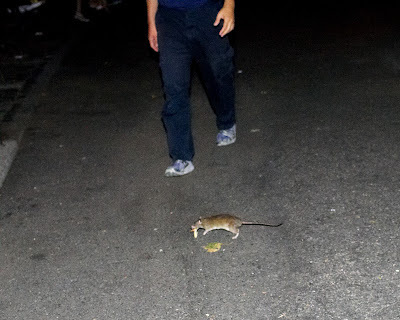 We have thus decided to present this too early and hastily prepared post in response to the situation described above as Part 1 of The Rats of Tompkins Square Park . 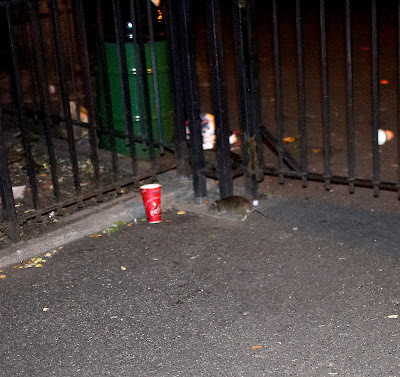 Most consider rats to be a problem in any number . 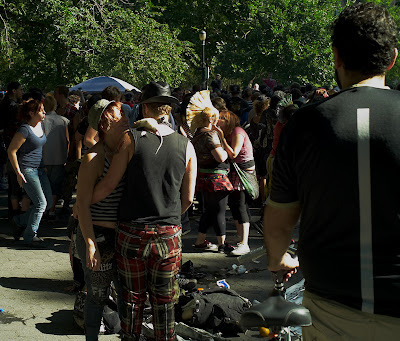 Tompkins Square Park likely does not have the worst of the city park rat infestations , for instance Union Square Park from what we have observed may well have a more serious one . 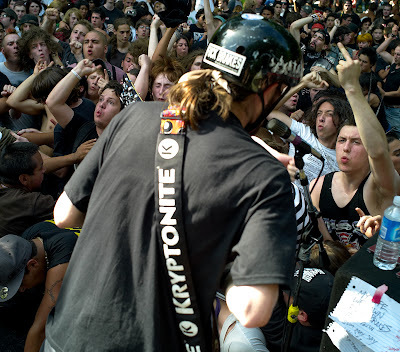 But it is true that there is a large number of rats in TSP . 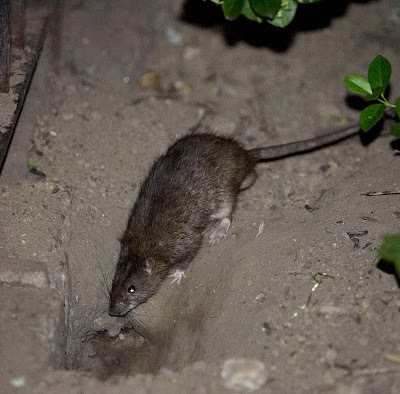 On Thursday night we photographed approximately 150 rats on the west edge of TSP in a period of 2 hours just after sundown when rats are most active . 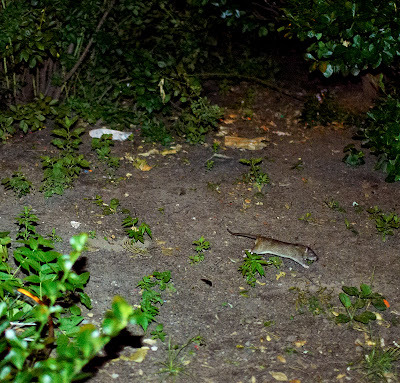 Some rats were likely photographed more than once . 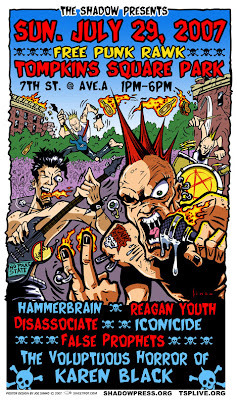 To see the little critters more clearly just click on the image . 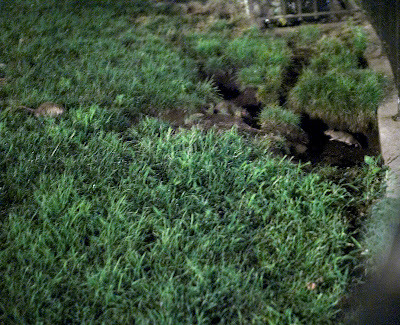 Above several rat-holes near the playground water fountain were filled-in Saturday but by Saturday evenining one of the larger holes was being opened-up below by a hardworking rat . 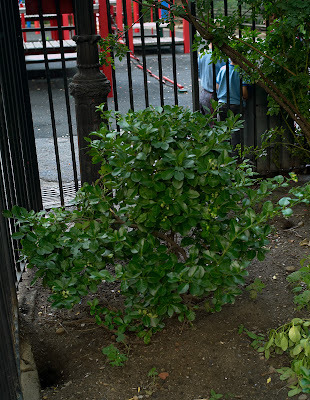 By Sunday afternoon at least 4 holes around this shrub had been re-opened by the diligent and hardworking rats. 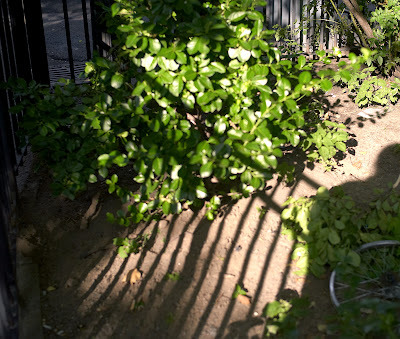 BELOW : Some more rat-holes that were filled-in Saturday at other locations around but still near the playground at the St Marks Place and avenue A entrance to TSP. Carrying home a french fry. 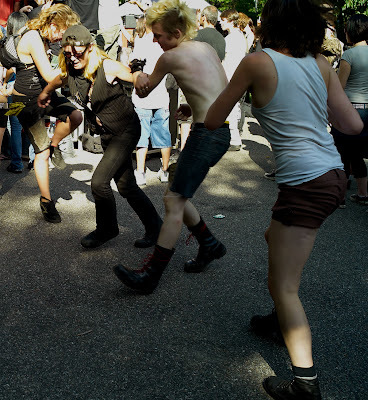 Searching for a hole that was once right here. 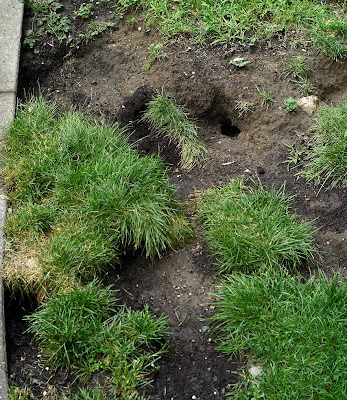 By Sunday afternoon one hole was re-opened by the rats at this location . 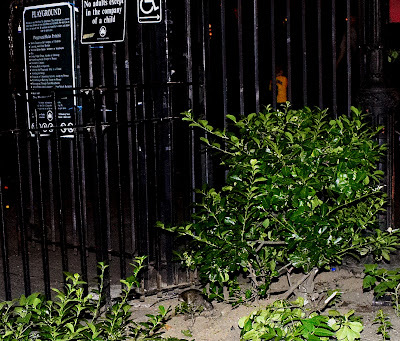 Scurrying from a rat-hole to the cover provided by a shrub . 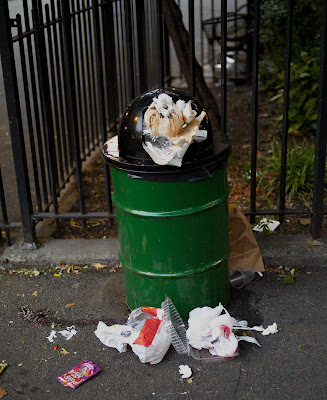 Foraging near a stuffed garbage receptacle at the entrance to the playground. 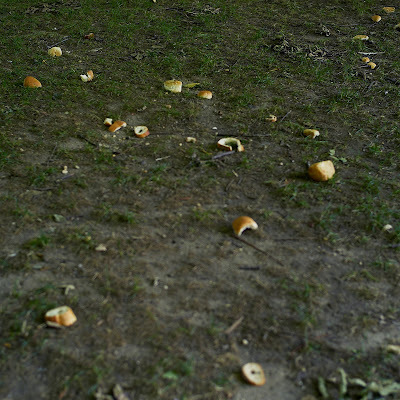 Well-meaning animal lovers cast bread on the lawn for the pidgeons and squirrels who can not possibly eat all , with the rats eating the lawn left-overs . 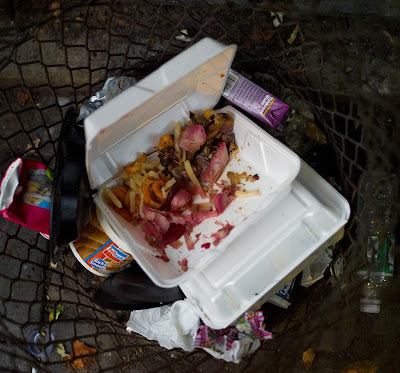 Rat populations need food and as can be seen above Tompkins Square Park certainly provides it in abundance .Bread and other foods cast on the lawns , open garbage receptacles and over-stuffed garbage receptacles with self-closing doors are simply everyday banquets for any and all Tompkins Square Park rats.